X-Small - $19.99 Small - $29.99 Medium - $29.99 Only 4 left! You remember when your kid's little Hatchimal was only a mystery bird in a speckled egg. The hatching was an unforgettable event, your child was so sweet the way they tenderly rubbed and tapped at the egg until, miracle of miracles, the little bird inside tapped back. You knew that your little one would be hooked as when you watched your child take the egg shell away and pop their baby bird out of its speckled little home. So, your caring kid has raised their Penguala has come from the cooing baby phase all the way to the grown up kid phase, they basically know how you feel as a parent now! So, what's the next step? Here's the thing, your child's little Hatchimal might just feel a little lonely in this world, surrounded by no one but humans. Sure, we've shown them plenty of care but that simply doesn't make much of a difference when you're a colorful bird and no one knows what you're really supposed to be. To solve this problem your little sweetie can make their ward feel right at home by dressing as their favorite little bird robot, Penguala. In the colorful colors of the newly hatched, your little one can play their favorite games with the little bird before going trick-or-treating, leading to some pretty awesome Instagram opportunities. 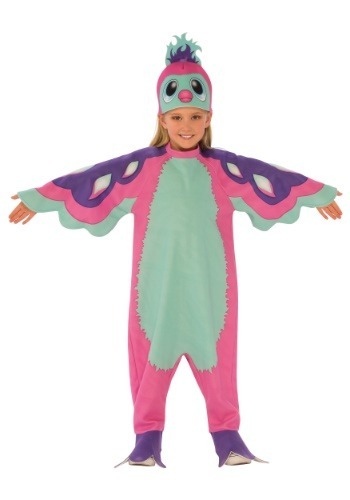 Your child will love flitting through the October air in the loose jumpsuit with colorful wings coming from the sleeve. Top it off with the hat with big eyes and flaming hair and whether or not people know what a Hatchimal is, they're sure to love them! In this colorful costume this Halloween, your little one is sure to come out of their shell!